Developers being too lazy to list their game elsewhere does not make it an exclusive. An exclusive means that the developers are not allowed to list it elsewhere. Obviously the goal is to list it in as many places as possible or practical. Good luck finding Dota2 or TF2 on any other launcher... ever. Before you rave about it's own game isn't considered exclusive/doesn't count, most Ubisoft games these days are on Steam and Uplay, but The Division 2 is going to be on Epic and Uplay. Steam pricing will need to change, hopefully for the better. Don't defend their business practices either. Good luck finding Dota2 or Teamfortress on any other launcher... ever. Before you rave about it's own game isn't considered exclusive/doesn't count, most Ubisoft games these days are on Steam and Uplay. The Division 2 is going to be on Epic and Uplay. Steam pricing will need to change, hopefully for the better. Don't defend their greed. Ubisoft lists on Steam because it can get more sales/profit that way. Developers own games are completely up to them. 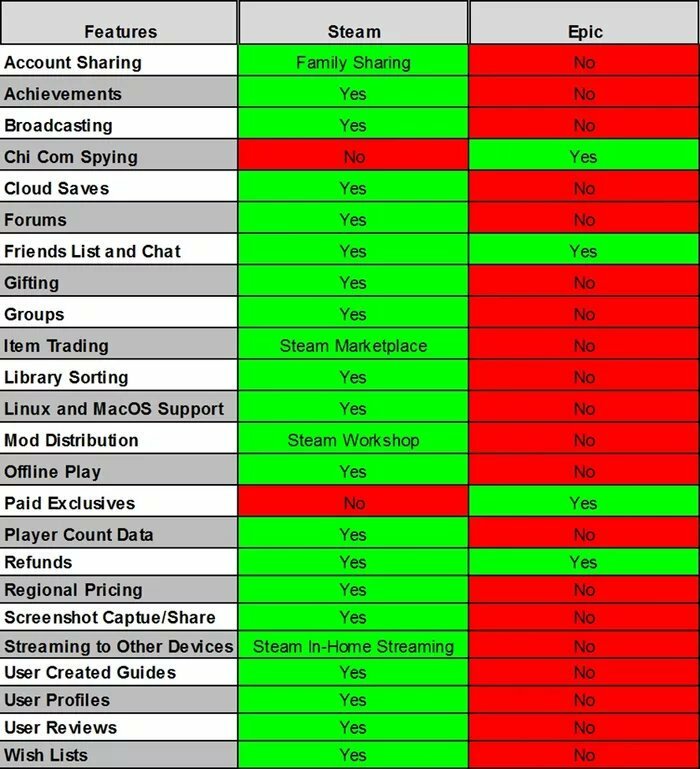 You'll also find all Valve games are not compatible with other launchers because they lack so many features that the games rely on. The whole point is about developers being paid to be locked to a certain platform. You said Tencent owns Epic, they don't. If Epic wants to do something Tencent can't stop them. If Tencent wants Epic to do something the most they can do is have one of their board members suggest it. If they were going to get a majority stake in Epic they would have done it in 2012. Tencent had a 93% stake in Riot in 2011. You do know that eventually tencent *could* own or have a controlling stake in epic? Which has been their strategy for past purchases. Epic does not share user data with Tencent or any other company. We don’t share it, sell it, or broker access to it for advertising like so many other companies do. As well as offline-support coming soon. Why are you being silly? Tencent are going around buying stakes in companies, then buying the whole thing. Why do you think Epic will be different? Why does doing the same thing they've been doing all of a sudden pigs flying? This really just shows your lack of knowledge. I can't click that link at the moment. Does he own 60% of Epic alone? i guess we can only take him at his word, but he'll sell one day - just a matter of when. Valve is next? Then what are you going to do. Until it happens, it's all at anyone's word. I'm not the one being silly - you say Tencent are going around buying stakes in companies, then buying the whole thing........ But that appears completely incorrect? Yes, Tencent buys stakes in other business (as one would expect for a company of that size), but it is quite rare that they buy a majority stake, let alone the whole thing. For a company that is continually buying stakes in businesses, they very rarely purchase any more. So, before you try to say that I "lack knowledge", perhaps you should actually do a bit of research yourself because I don't appear to be the one to lack any knowledge. And there is a very long list of things that do not have a majority stake, many of which are very close for example Epic Games at 40%. They own 5% of Ubisoft, now thats a pretty clear sign they aren't attemping to take them over. TC are getting very big, locking up PC exclusives will be a big deal to them as part owner. I gave you a list of games it has ownership of, which is quite significant compared to other companies. Just because they have some smaller investments it doesn't discount their larger investments. Epic is one of those larger investments and they don't exactly need to go very far to get controlling ownership if the opportunity arises in the future.